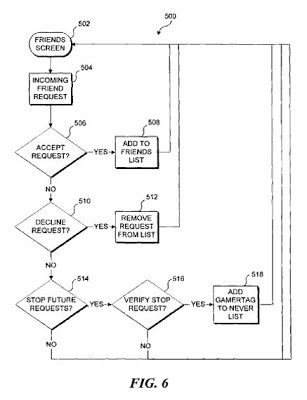 The ‘608 patent describes a method for enabling a user to load a game and to automatically join an online game with a friend selected from his friends list. Ordinarily, when friends want to play together they must have the same game loaded. With this invention, however, a friend can join another friend on his list without having the same game loaded. If the friend wants to join a game that he does not have the disk for, the invention allows him to download the game to his hard drive where he can then play the game. A user who has signed on to an online gaming service can send an invitation to a friend appearing in the user’s friends list to join in playing the game the user has loaded or may join the friend in playing the game being played by the friend, regardless of whether the game title played by the friend is the same as that loaded on the user’s game console. If the game titles are different, the party needing to load the game title to be played is prompted to do so, and then prompted to reboot the game console. Information written about the new game to be played is automatically written on the hard drive of that party’s game console and automatically accessed after the reboot for use in expediting the log-in process of the player who had to reboot. 1. A method for enabling a user to load a game and to automatically join an online game with a friend selected from a friends list of the user, comprising the steps of: (a) initiating a gaming session by logging a user on to an online gaming service; (b) identifying an online game associated with the online gaming service to join that is currently being played by the friend, wherein the online game is different than an online game currently loaded for play by the user; (c) causing data identifying the online game currently being played by the friend to be stored in a local non-volatile storage; (d) prompting the user to load the online game currently being played by the friend; (e) restarting the gaming session of the user with a newly loaded online game in response to user input; and (f) automatically comparing the online game being played by the friend, as indicated by the data stored in the local non-volatile storage, with the newly loaded online game, and automatically joining the online game being played by the friend by bypassing at least some login requirements and without requiring any logon or password when it is determined: (i) the newly loaded online game is actually the same as the online game currently being played by the friend; (ii) the current online game being played by the friend has an opening for the user to join; and (iii) the online game of the friend has not yet concluded.